There are a lot of reasons I write in this blog. One of them is to remember. This morning, Henry looked up at me and said, "I thought it would be nice to take a walk. I can drive Cruckie and you can walk." Its cold, but sunny and we will be going on a walk before our drive in to Baltimore today. Today we exhaled and began mentally preparing ourselves for the next stint of chemotherapy. It was a generally relaxing day composed of our now typical activities - a few errands, a Cruckie ride or two (or more), playing with some neighbor friends and some nice time with visitors. Henry was in a pretty good mood today with one exceptional outburst while outside riding Cruckie. I'm still not sure what set him off, but he cried with his head down for what seemed like many minutes. He wouldn't let me approach him and I, of course, didn't feel right walking away. I sat on his truck's hood and waited it out. I hoped that I was assigning more to his emotions than was plausible, but I imagined some of the same thoughts as I was having, going through his little head. A nondescript feeling of dread, of the feeling that while this was all well and good, it was becoming more difficult to enjoy the closer our re-submersion into the throes of chemotherapy came. It was over as quick as it came and he was happily driving down the street, a blessedly short memory. Tomorrow we're back at Hopkins for a checkup. They'll draw his blood to make sure his system is where it needs to be for stem cell harvesting and re-entry for chemotherapy. I'm hoping this will be a relatively short visit. I'll have to make use of the time to inquire about some insurance discrepancies, additional supplies that we require and some general questions about what's to come. Over the next four days, we'll administer double doses of G-CSF, the stem cell stimulating drug that will send his cells into overproduction for harvesting. These cells will be saved for the high-dose phase of chemotherapy. Monday evening we'll be at the Children's House again as we expect an early time for a surgery in which he'll have an additional line put in for the express purpose of the stem cell harvesting. He'll be sedated all day in the Pediatric Intensive Care Unit. The line should then be removed at the end of the day and then I suspect we'll be moved to the Oncology Floor. We're grateful for at least having the weekend to be at home as a family again before beginning Cycle 2. Today Henry woke up a little grumpy but turned around quickly. After his sisters left for school, he watched his morning regimen of 'Franklin', 'Oswald', and 'Dora the Explorer'. Then we finger painted for a while. While the paper was a popular choice, so were our noses. He loads up the back of Cruckie with mail and then tears off around our circle while I 'chase' him. He cackles the entire time. He'll round on me and try to run over me and still, he just laughs like its the funniest thing in the world. I warmed up a bowl of soup and sat outside and watched him awhile. He'll go round and around in circles that would make any adult dizzy. Another marker of his interim recovery right now is that he asked for a snack that was an old favorite - gummy snacks, peanuts and raisins. This used to be all he'd eat, and in fact became synonymous with the word 'snack', but we haven't heard a request for it for months. So he rode around with his snack in Cruckie for about 10 more minutes and then pulled into his regular parking space in the street which, by the way, he pulls into with a precision unmatched by most mature drivers I know. He sat with a frown on his face and I approached him. "What's wrong buddy?" I asked. "My tummy hurts," came the response. So we came inside. This phrase has come to mean so many things. It's rarely hunger. It was born of nausea and constipation, but now seems to indicate that he recalls his central line and that, I'm sure, begets further thoughts of the hospital and his stay there. He's now having a bit of well-earned relaxation in front of the television and then we'll be off for a nap that he likely won't take. I've got some running around to do and Granya has stopped by to give me a little time to get out. A welcome respite, but one filled with a bit of anxiety as we've both - Henry and me - become accustomed to being around one another all the time. Yesterday we decided that we should get the house ready for the holiday season. Usually this entails dressing in our snow gear and boots and heading out to a tree farm. This year, since we cannot have any plant material in the house during Henry's neutropenic times, we headed to Target instead. We walked away with a 7 1/2 foot fake tree which had to be de-coned for us to use. Within a few hours we had our house looking like Christmas. We had guests from Granya's church come in the afternoon to keep us company. In the evening Tara's sister and her family joined us for dinner and visiting. Henry enjoyed playing with his cousin Charley. It was a happy normal day. After everyone left for the night, it was Henry's bedtime. We prepared his nutrition and read books. Perhaps because of the evening's activities or a late nap, he did not fall so quickly to sleep as previous nights. He likes company as he falls asleep now and we're happy to oblige, but this night, I fell asleep first. I awoke and he was out. I stumbled downstairs for a bit of TV before bed. I had a hard time falling asleep when it came time for bed. The busyness and ease of the day had its repercussions in the quiet of those moments before sleep. Our situation becomes easier to ignore during a hectic day, but its weight bears down heavily in the stillness at night. Tara and I went to bed about 10:30p last evening after starting Henry's TPN (internal nutrient feeding) and woke up about 7:30a. That was the first time since two weeks pre-diagnosis that we've slept uninterrupted all night. This was to be a harbinger of the day to come. Henry was happy and pleasant and seemingly pain-free for almost the entire day. He ate cheetos for breakfast, pretzels and cookies for snack and several small servings of mac and cheese over the course of the day. We cautiously went shopping for some more comfortable clothes for the hospital and when we got home, he played on the floor with his trucks and cars. Best of all - he laughed. He laughed and he giggled and joked around. Bath time and medicine time are still very difficult. These times seem to remind him that all is not normal. Medicine that he took easily before this last stint in the hospital is now a four-handed operation - and sometime two legs. Fortunately, we have only one medicine to give twice a day - and only through tomorrow. Bath time tonight was especially tough. It seems that whenever he is reminded of the tubes in his chest he says 'my belly hurts'. To me this is clearly his form of denial. 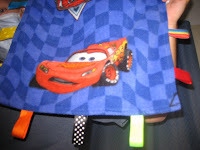 We had to put a special water tight bandage on over his central line to keep it from getting wet. It didn't really work that well and to boot it created another crying spell. We prepared his TPN for tonight and put him to bed. 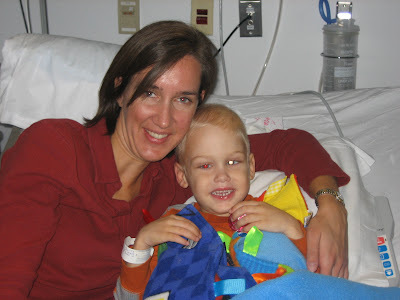 Reviewing the day in my head, I realized that the normal day allowed me to forget about Henry's cancer for a time. I too had my own forms of denial. When presented with his fighting and rejection I reacted poorly. I was angered by his spitting his medicines and fighting bath. Couldn't we have just one normal day? Of course its not his fault. I felt awfully for becoming angry. I'm glad Tara was there as I was able to vent far from Henry. I feel in a way that we must allow these oscillations of emotion for ourselves and to lean on each other for breaks. This just caught me off guard today. I don't want to waste my time with him being upset or angry. Henry rested well last night. Since he's been home he's complained only a bit about his belly - we're not sure if he's hungry or hurting. Nothing sounds good to him to eat although he's sampled several things which we take as a good sign; a few bites of pancake, oranges, and an icy pop. Tara's mother is here today cooking up a Thanksgiving dinner with all the fixin's. She's seeing to it that we don't go without turkey this year. We had a fire in the fireplace and did puzzles, a craft and of course, bundled up and rode 'Cruckie'. Its a strange sensation being home now, nerve wracking in a way. In the hospital, there are all the resources you could possibly need. He gets most of his medicines intravenously there. At home, we're at the mercy of the medicine delivery and the home nurse, which are running late today. We have access to all the hospital phone numbers and such, but after the fever episode, it is unsettling being at home alone. We've been so busy running back and forth and trying to keep him comfortable that today, with three adults and only Henry here, I'm a feeling some nervous energy. I hesitate getting into anything for fear of not paying close enough attention to Henry. These fears are, I tell myself, normal. As the day draws on I feel myself relaxing a bit more. Which apparently we'll have time to do more of soon, as well as a bit of time to catch up on some household details gone unattended. The oncologist told us today that we won't have to be back at the hospital or the clinic until Friday next week. That's the longest time at home we'll have had since the day of Henry's diagnosis. I think they're still 'treating' us, understanding that recovery, both mental and physical, for all involved is necessary. Our next step will be for Henry to have another central line put in for the singular purpose of harvesting his stem cells. He'll take four days of high-dose G-CSF in order to spur his cell growth. Then he'll be put under for duration of the actual procedure, approximately 8 hours long. Following this we expect to be admitted for our second round of chemotherapy. We're trying to catch our breath while we can. The best Thanksgiving news of all: we're being discharged today! We will likely not make it home till evening, and we plan on a full turkey dinner tomorrow. We will (hopefully) be home for a week before returning for chemo round 2. Our love and thanks to all of you, our friends and family, for the love, messages, support, and prayers that are being sent to our family. Enjoy your turkey, eat your pumpkin pie, and hug your family. Have a happy Thanksgiving!! One of Henry's newly discovered distractions is my camera. He's very interested in all things mechanical. Often when we're driving the car, he'll ask detailed questions about 'what button' we're pushing or how we make the car slow down. So the camera was no different. We've already had to charge the battery once and as we speak I'm downloading approximately 200 pictures of his taking. He specifically tried to get pictures of the TV, the wall, the ceiling and the IV pole. 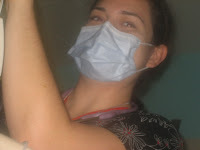 He also had his stint trying to photograph people, Tara and I were his main targets, but the nurse didn't escape either. I was the subject of one series which, when looked at continuously on the camera screen, appeared as a poor quality movie they were so quickly taken. My son the paparazzi. His Favorite Blankie from Grandma. Its morning and there's no sign of any poop yet. He rested well enough. There was a bit of puffiness along the lower portion of his head incision I noticed last evening. The floor resident was uncertain of the cause, so she had the neurosurgeon team notified. I was impressed with their response. One of them came down within an hour. Dr. Jallo, the surgeon who performed the operation came in the morning after his reconnaissance team visited. The consensus is that it is an 'inflammatory response', a result of his resurgent white blood cells, which, by the way, are shooting through the roof now. Our last reading was 1280. They're confirming the reading from this morning now, but the preliminary read was 4000. Gotta love the immune system. This trajectory is apparently due to one of his daily medicines, G-CSF, which stimulates their growth. We're facing another unexpected issue now. His constipation is keeping us in the hospital beyond when they'd normally send us home. His fever has broken, hopefully for good this cycle. His counts are returning in force, which is a requisite for, you guessed it, second round of chemotherapy and back in the hospital. Hopefully we'll get a day at home, but they also need to harvest some of his stem cells for what is called a autologous stem cell transplant. They will take his stem cells that generate marrow and give them back to him during his high-dose chemotherapy - cycles four through six. I believe this is an outpatient procedure but is anticipated before our second cycle of chemotherapy. We don't have a very big window in which to accomplish it though. The nurse was doing his repeat blood draw this morning to confirm his counts and he asked for a musical snow globe his grandmother brought in. This is one of those things that before I used to look at and wonder how long before he'd get bored of it and then I could 'retire' it. When I see him play with it now, I see it completely differently. I see his eyes light up and his brain trying to figure out what's going on to make it work and just the smile it brings to his face. I don't really care if that lasts 10 seconds, 10 days or 10 weeks. If it brings a smile now, its priceless. Over last 72 hours our focus has been two things. First, Henry's ability to fight the infection he currently has. His fever seems to have subsided, corresponding with the increasing trajectory of his white blood cell count, now at 1280 per cubic millimeter. The 'normal' range is between 6,000 and 17,000. This is the most encouraging news we've had since this visit began. We will continue to monitor these numbers throughout his chemotherapy. Our focus now is on his Vincristine-induced constipation. A couple of days of constipation is bad enough. Henry hasn't gone for almost 2 weeks. Now that his fever has come down they're willing to try more aggressive measures. To date he's only been taking things from 'above'. I'm writing this during the 6 hour intermission between enema #1 and #2. Each enema requires 3 nurses and myself to hold him down. Afterwards Henry was completely exhausted from struggling, straining and screaming. He rested well for a bit, but we're still waiting for the dam to break, so to speak. If #2 doesn't accomplish its goal, we will continue with more drastic measures tomorrow - manual disimpaction. I'm hoping for a productive night. It's 4:30am. Henry's been up and down all night with stomach pain. He's been irrationally insisting on a wagon ride for the last 10 minutes. The nurse came in to draw some blood. I decided I needed a break - and some food. I sat down on the couch in the parents lounge while I waited for some leftovers to reheat. 'This is the most uncomfortable couch I have ever sat on', I think. We're surrounded here by reminders of just how serious this whole business is. Monitors, nurses, medicines - these become routine. But when you see a child on a wheelchair going to the elevator for a test or kids playing in the playroom with their masks on, or the black and white pictures of hairless children on the walls, or the buzzing in the halls that indicates a child's oxygen isn't what it should be, or wondering how many kids have been in the same bed that yours is, the screams of the kids getting treatments like NG tubes or spinal taps or some other torture - all of these things remind you of the seriousness of childhood cancer. I glance up to a sign next to the uncomfortable couch. Superman has nothing on my son. He's been hit with so many drugs, chemicals and medicines I can barely keep up with them all. He's had test after test after test and he's been laying in a hospital bed for weeks. Yesterday he lost his hair. Today he had a tube put down his nose, he didn't like it, but he tolerated it. He listened when I warned him it would hurt and did it anyway. We went for CT scan later and he lay there still and waited while 3 people picked at tubes in his chest. The sound of the machine startled me, but he lay there and took it like a man. I've never been more proud of my son. He's my new superhero. I woke up to a pounding headache this morning. I can't decide if its general stress, caffeine withdrawal or from the habit of grinding my teeth at night. I took some Excedrin and tried to fall back asleep but it was futile. The lights seemed too bright at 5:30am so I lit some candles and turned on a hot shower. We've been getting the itemization of bills from the hospital. I suppose they send them so that you appreciate the insurance company. It's certainly having that effect. My heart starts racing with each envelope that comes. I've heard of the stories of fighting with the insurance companies about coverage during a time like this, something I dread. So far, no sign of it. In fact, each time I'm on the phone with our provider, they consistently end the conversation with words of empathy. I hope that extends to any differences we may have in the future. My mother returns home today for a short time and will return in early December. She's been our primary source of support during these last weeks. I think she'd rather stay, but I'm glad for her to return for a while to rejoin family there and to put things back in order after her abrupt departure in mid-October. Thank you Mom. We're all off to Baltimore early today. We'll leave the girls with Tara's folks, spend some time with Henry at the hospital and then get over to the airport. I'll swap with Tara and we'll start the week again. We're crossing our fingers to be home by Thanksgiving, but we're not counting on it. Tara arrived early to take over for me at the hospital. We spent a half hour or so reviewing his care, our thoughts and some plans over the next couple of days. My mother returns to Kansas tomorrow for a couple of weeks, so I'll be driving her to Baltimore on our way to swap again tomorrow. Before I left the hospital today, I leaned down to give Henry a hug. I felt the warmth of his feverish neck on my nose and his little arms reach up near my shoulders. I kissed his neck and felt the layer of fallen hair all around him. It felt so good to have him hug me. He took one hand down and reached for his beeble (his binky) and kissed me. What a sweet boy. I drove to a soccer tournament for Anna directly from the hospital. I didn't arrive in time to see even a part of their last game. I was, however, the beneficiary of an amazing act of generosity and support from the team, parents, and my extended soccer family. Just as we didn't ask for Henry's cancer and feel helpless regarding its outcome, the generosity of friends, family and coworkers has been equally overwhelming and we're in awe of the outpouring of kindness from everyone around us. Someday, its my sincere intention to explain to Henry, what kind of love and the extent of support that was provided him and his family by those around him. I can only hope that it will help him become as caring for others as those around him have been to us. As it is, I expect that these times will leave a lasting impression on our girls and give to them a generous and caring heart for other's as well. Tara called me late in the day and told me that Henry was finally tired of little hair falling all about and they'd pulled the remaining bits out. She says he has a fine 'fuzz' over his head. I heard her over the phone saying she liked his 'new haircut' and its just like daddy's. I'm proud of him for handling that so well. They went on an elevator ride and took a wheelchair to an x-ray today to check out his belly and his chest. Its good for him to get out and about. Everyone's off to bed now as I write this. We're hoping that his constipation issues resolve soon as its preventing him from taking some of his medicines and causing a lot of anxiety about nutrition. As for now, we're just going to try for a good night's rest and cross our fingers for tomorrow. Henry slept from about 11am today until around 5pm. This is the longest period of restfulness since this whole ordeal began. He rested quietly and when he did wake up, he was in a fine mood. We talked and took another wagon ride. He asked for food - he hasn't eaten it yet, but its a start. His constipation issue seems to be 'moving along' (for lack of a better phrase). Henry's had all kinds of medicine today. Zosyn, Amikacin, Bactrim, Tylenol, Miralax, Senna, Nystatin, Ativan and something called Larry's Solution. He's begun getting intravenous nutrition or Total Parenteral Nutrition (TPN) because he won't eat. He had his platelet transfusion early today too. For all the stuff they've given him, the thing that made him feel better was good old fashioned sleep. Sometime after his nap, he said, "I like it when you hold me." He spent a little time on my lap. We laughed a little. I put him back in bed. We read books and he fell asleep while I read to him. His peacefulness tonight was the best medicine for me. He rested quietly again this morning after a decent night's sleep. Henry's carried a fever of well over 100 F for most of the night. Before he fell asleep last night, he had an episode of increasingly irrational behavior - random phrases he'd repeat over and over, sometimes angrily. "Who's going to cut the rope?" "Who will catch my poopies?" "I don't want to cut my lips" This lasted for close to an hour. He couldn't be talked to or consoled. In fact the more I tried the worse it seemed. I got quite anxious and pressed for the resident to speak with our oncologist. In the end, the attending from the floor below came up and reviewed the resident's assessment and assured me that it was likely due to the fever, but they'd monitor it closely. They gave him Ativan and within minutes he calmed down. His temperature returned to close to normal and he slept. He'd wake every couple of hours and twist and turn, groaning, "I want to go on a wagon ride". 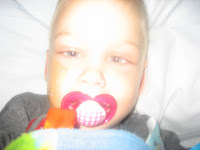 Overnight he continued to receive tylenol and antibiotics (Zosyn & Amikacin). His platelet count had dropped sufficiently to require a transfusion (Platelets = 22, normal 150 - 350 K/cu mm), this following his blood transfusion from yesterday (RBC 2.33, normal 3.9 - 5.3 M/cu mm). Thankfully, he had no reaction to the platelet transfusion, which apparently manifests quite quickly via specific abdominal sounds. His counts are not yet showing signs of turning around, but I think that they should be soon. We are still awaiting his Vincristine administration, held over from day 15 (yesterday). This morning we finally went on the long awaited wagon ride. It was short-lived, as expected. He's uncomfortable sitting up yet. The desire is good though. We went once around the floor, pointing out the different parts of the beach scenes painted on all the walls. We returned to the nurse changing his bed sheets. They're beginning to be covered with his hair that has now begun to fall out. I'll run my hand through his hair and its as if he's shedding. This promises to be anxiety provoking for him. As much as we've talked about it, he's fearful of anything different right now, not to mention he hates hair in his mouth, which seems inevitable. I try to think of him without hair. Like anything along this journey, I can't quite seem to imagine how it will seem to the full effect that reality is sure to bring. We're prepared with stocking caps and the like for him (and me, as I've shaved my head for solidarity). Every new bump we encounter makes this more and more real all the time. When I'm home things seem relatively normal, when I'm at the hospital they seem, well, different. My idea of normal is starting to adjust, the home version and hospital version are merging into a new idea of what normal is for us now. When you have no white blood cells simple things are dangerous. I never thought a fever could be as scary as Henry's was yesterday. They told us to expect it, I guess I just didn't think it would be so soon. He had fits of discomfort all morning and by 1pm was running a fever of 100.3 F.
He was a trooper and put on the mask with no problems. We went to the Washington County Hospital Emergency Room where they drew blood and, after consulting with our doctors at Hopkins, they started him on two broad spectrum antibiotics to try to kill the infection. They gave him a chest x-ray for pneumonia and dipped his urine. They began culturing his blood but that takes days to grow. We sat in the hospital for about 7 hours through this and were finally taken by ambulance to Hopkins. Tara took over for me to get him down there and she and Henry didn't get into a room until around 3am. Long day and short night. He is currently being monitored and treated for constipation. He's to get a blood transfusion today to help his red blood cells recover. He was also already scheduled to get his last dose of Vincristine for this first cycle of chemotherapy. They will not let Henry leave the hospital now until his counts return to a certain level. This is entirely dependent upon him as an individual. Some recover quickly and others take longer. It may be a week before he is able to return home; then it will be for a few days and we'll have to go back for his second cycle. Tara told me this morning that Henry has handled the adversity fairly well. He is more comfortable than he's been as they're giving him fluids; he hasn't been drinking much. I'm going down today with Tara's step-father to relieve her and so she'll have a safe ride home. Our plan is for her to come back on Saturday and do the same for me. Surveying our lives today, I was trying to imagine myself on October 12, looking at myself today sitting beside his living-room bed side, with the 'Childhood Brain and Spinal Cord Tumors' book sitting there, a three and half inch scar on the back of Henry's head. I feel fairly certain I would have considered it a nightmare and so unlikely an event that I'd dismiss it almost immediately. But here we are, admitting the accuracy of the oncologist on the night mentioned above, assuring us that we'd acclimate and do what then seemed impossible to consider. I couldn't have believed one month ago tonight that I'd ever laugh or smile or be able to cope with all of this and I'm somehow comforted that, having made it this far, that we'll be able to go the distance, buoyed by the unending support of family and friends. If you don't know what's around the corner, does that mean its not there? 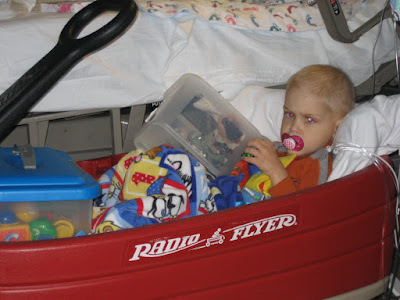 Before Henry was diagnosed, I never fully considered the weight of that question. Today brought more tough challenges. Tara returned to work. Henry had his first day back at the hospital since our first chemotherapy and we faced up to a bit of the reality of having a chronically ill child. Partly because of her background and partly her nature, Tara has consistently been thinking several moves ahead of this thing. For me, I just don't digest it until it happens. I don't know if one or the other is better, perhaps they're complimentary in our situation. Tara has talked to me about the long days of tests, I've imagined scenes of road-side stops holding the head of a vomiting child, sick from chemo and even considered how I'd handle a roomful of children with no-hair, realizing the circles of lives that had been up-ended with their diagnoses. My imagination, it seems, just isn't up to the task. I feel like I barely made it - and that was with the help of my very capable mother at my side. Henry has a rash around his midsection that I can only guess must feel like fire sometimes as gauged by his reaction. Guessing among that, nausea, constipation and general aches and pains - and what to do for these - parental anxiety is constantly piqued. All these things seem intensified by the hospital. I'm not really sure how our 1pm appointment kept us there until just after 5pm, but those were long hours. His blood count resulted in having to schedule Henry's first blood transfusion (for Thursday) as his red blood cell counts are low. His white blood count is so low, its below the testing threshold. This means - and its nothing they didn't warn us of - that he is at high risk for infection. If we measure a temperature over 100 degrees, then we're off to the emergency room at Washington County to be later admitted to Hopkins. So as Henry drifted in and out of sleep and fits of unease, I wondered what was next. Will we be back in Baltimore yet tonite? Tomorrow? Wednesday? This didn't heighten my anxiety as I thought it might. In some respects I feel like we're watching a piece of paper unfold. Some we can see, some we cannot, but either way, its all been written. I look at pre-diagnosis pictures of Henry and realize the cancer was there. We just didn't know about it yet. For some reason thinking of things this way releases me from feeling like I have to control everything and just helps me to accept it. So what will tomorrow bring? Just because we don't know doesn't mean its not there - we just can't quite see around the corner. Although cold outside, there was some warmth in the Scheck household today. We began the day early with Henry up at 5am. Yesterday he really seemed uncomfortable. All day long the parental concern was on high alert and took its toll. I suspected today would be similar but again we were surprised. Henry's comfort level today was improved. He rested well, taking a two hour nap around 1pm. Grandma Linda and Grandma Jane kept the girls busy today with crafts and activities which contributed to some quiet around the house. He didn't moan with discomfort as much today either although he still clearly had some rough times. He's got a rash around his mid-section that seems to be very irritating to him as he continually scratches. Lotion seems to ease this a bit along with an antihistamine we've begun giving him. He still complains, although not quite as frequently, about his stomach. We're not sure if this is nausea, constipation, or other side-effects of chemotherapy. We've spread out his doses of nausea medications which hasn't seemed to effect his comfort level so we'll probably continue to reduce or spread them out as we go. I feel like the body will do its best to correct itself but will have difficulty when there are so many other things going on. Getting him off some of these medicines, as long as it doesn't affect his comfort, should hopefully help. Tara found some encouraging information on the internet regarding a recent study for high-risk medulloblastoma that suggested some increased survival rates. Nothing to pin our hopes to necessarily, but encouraging nonetheless. Tomorrow my mother and I take Henry back to the hospital for a clinic visit as Tara returns to work for the first time since this all began. Henry is currently in the midst of the nadir of his white blood cell counts. Days 10 to 14 are to be the worst according to the oncologist. So far our hand washing and household cleaning regimens have seemed sufficient, although as the season progresses, Tara and I are preparing ourselves for at least one or two unplanned trips to the hospital. My anxiety for tomorrow is mostly about the ride in the car. Henry's not keen on wearing that darn mask and the motivation of leaving the hospital is definitely not the same as returning. They've told us that its possible that if his counts are lower than expected, then he may need platelets or blood transfusions - apparently the blood transfusions take some time and may require another trip the following day due to our late appointment time tomorrow. And so it goes, another day of withholding expectation and just riding with the tide of what comes. We're learning day by day that to hope for one thing or another will only serve to create another expectation to lose. As fast as this is all coming at us, I'm finding it easier to live in the moment and accept what is. Yesterday I got out of the house a bit to go to Anna's soccer practice. Although it was chilly, it felt good to be outside doing something. Another wonderfully supportive circle of friends for me and our family. It was a great few hours. Tara had a similar experience the night before with her mother and sister as they'd gone out for the evening. We're finding it necessary to recuperate this way now and then. So much more than normal, it becomes a deliberate expression of dedication to each other and Henry that we aid in our mutual ability to be on top of our game. Each day we have to give Henry numerous medications. I mentioned previously his aggravation with us regarding the taking of medicines. While he takes them more cooperatively now (with less spitting and holding down) its still an unpleasant task for all involved. When he's tired it's a bit of a fight. Our bedtime now involves a 25 minute course of medication, that I hope becomes routine. It's not painful for him, but its clear that he's disturbed by the whole thing. After giving last evening's course - during which he fell asleep - I walked into the hall and remembered how we used to brush his teeth then run full speed into his bedroom to cover himself with this covers and 'hide'. I'd do the "Where's Henry?" thing for a few minutes and he'd giggle like crazy and then 'scare' me. Books would be read, kisses and hugs given along with "I love you" and songs. I'd say - "Henry - I have one question for you...deal or no deal?" and I'd tickle his chin with no mercy until he'd squeal "Deal! Deal! Deal!". As I passed his room tonight on my way to the stairs, leaving him asleep in ours, I wondered if I'd see him do that again. Some of the losses we've felt over the past weeks have been enormous - shaking practically every expectation of our lives - and some are coming in tiny bits and pieces. Things will undoubtedly be different. Right now, we're just so unsure how. Our day home yesterday was one filled with new routines interrupted by reminders that this is now the norm. In the hospital Henry was on intravenous medicines managed by the nurses. At home, its all us. Leaving the hospital knowing this was reminiscent of leaving the hospital with our first child - glad to be going home, but nervous about new responsibilities. We'd had to get four medicines from the pharmacy and once home we received a good sized box of medical supplies and instruction from a home nurse. She taught us how to administer the medicines intravenously through his central line, a catheter into one of his arteries. There is a series of six syringes that must be given in a specific order over the course of 20-25 minutes to be given daily. This medicine is to provide him with a stimulating agent for his bone marrow, that is to say, boost his white blood cell growth and increase his natural immunity. The catheter in his chest allows us to do this easily without pain, but he still gets very aggravated by any attempt to give him 'medicine' in any form. Henry has a bed in our living room now for lying down during the day. He alternates between that and sitting up in the chair, as well as activities here and there when he finds small bits of energy. He seems to still be experiencing some of the effects of chemotherapy in that he's lethargic, a bit nauseated, and his appetite is all but non-existent. They warned us of this and we know we've only been 48 hours, but its difficult to watch as a parent. Coming home after his tumor resection was so different. He was playful and interactive, we could be outside and have friends over. I was able to forget about his condition for a while and just rest in the enjoyment of him playing. After the chemotherapy, however less outwardly invasive, he seems to have at least a low level of discomfort most of the time and is tired but doesn't seem to be able to nap easily. That said, he did have a feel-good spell of activity today. He played a board game with Mommy and rode his 'cruckie'. (He's allowed outside with certain restrictions) He ate just a bit of ice cream too. These brought a few smiles to his face and, of course, to ours. We're Home! The first round of hospitalization for chemo is done. The day started early with Henry getting up at 3:30 am. Yes, that's 3:30 am. Not a typo. The first thing he wanted to see was the calendar that Tara had made for him with a smiley face on the last day. "I want to see my red smiley" were among his first words as he woke. He was ready to go home. Tara called for reinforcements early and I was out the door a little after 6 to avoid traffic. After some medicine to calm his stomach (he didn't get the cisplatin until this morning), he played quietly for almost an hour with his trucks. I would have given $100 for a camera at that point. I just sat and watched him while Tara caught up on some sleep. It was wonderful to see. His mood deteriorated as the medicines waned, not to mention his lack of sleep was catching up fast. He insisted on sitting in his stroller - I don't think he wanted to miss the opportunity to take off. He was feeling pretty cheeky too. He wouldn't let me turn the TV on for him (a grand distraction) and kept switching it off using the hospital remote as I fumbled with the channels on the main TV unit. He won that round. Tara finally talked him into the TV and into sitting on her lap instead of the stroller. He fell almost immediately to sleep. He didn't wake up until I was pulling the car around to leave about 4 hours later. The motivation was strong to leave that place and the rest he'd had didn't hurt either. The mask was on him when Tara, our nurse and Henry strolled up to the car. I was secretly glad I didn't have to have that fight with him, but it didn't turn out to be bad at all. He made it most of the way home without much of a fuss. The construction zones where we had to don the mask again and again were uncomfortable reminders to him and he became intolerant of the it late in the drive, but I considered the whole thing a great success. We drove up to the house and to wonderful welcome home signs made by the girls and some of our lovely neighbors. Henry quickly settled in to watching TV. He perked up so much when the Anna and Sophie got home. They huddled around him like bees to honey. They brought him toys and talked to him. He responded with more voice than he had the entire day to us. Tara and I both teared up because it became immediately apparent that the girls would be able to do things for him that even we, or the doctors, nurses and social workers for that matter, just couldn't. Tonite we all watched a movie together. Henry went to sleep early and easily. There were no demands on our time this night. Tomorrow we realized we had no plans either - a quiet day ahead. 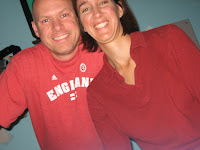 Next week Tara will begin to work again; just part time for now, but symbolic for us of a return to some normalcy. We are back at Hopkins twice next week for blood count checks, dressing changes, additional outpatient chemotherapy and the like. But for now we have a few days at home and we're so very glad for it. Seven days has never seemed so long. I'm sure it feels even longer go Henry. Its obvious he's tired of lying in bed day after day, seeing people come and go while he has to stay. He's even begun to deny the television as a source of distraction. During his moments of relief today he played with dozens of cars and trucks and has been play acting with his teddy bear, delivering medicines in tubes we've made to look like his central line. He takes the bear's blood pressure and temperature, changes its bandages, and gives it medicine, then says, "You're sick. You cannot go home!". One more day we tell him, one more day. Yesterday evening Henry received the same dose of medicines as the night before; Etoposide (2 of 3 doses) and Cyclophosphamide(2 of 2 doses). Tonight, along with the final dose of Etoposide, Henry will receive Cisplatin. This drug is the reason for the baseline hearing tests done last week. One of its more frequent side effects is loss of hearing in the high pitch range. They dose very carefully and conservatively to do everything to avoid this outcome. He will be tested at the end of the month for hearing loss. They assure us that the tests they do will be able to detect otherwise unnoticeable hearing loss. As with some of the other drugs, it may also contribute to the hair loss (alopecia) seen in chemotherapy patients. In addition to the chemotherapy medicines he is on, he has been on several medicines for nausea - Odansetron, Benadryl, and Ativan - as well as one to prepare him for the Cisplatin called Mannitol, which apparently opens the blood-brain barrier (for greater chemotherapy effectiveness) and flushes the kidneys. The intensity of the treatments seems to have increased throughout our week here. Our only encouragement for the following cycles when we have to return are the words of our nurses and doctors alike saying that the first cycle is the toughest to endure. Tomorrow we come home to a different world. The mask Henry must wear out of the hospital is a looming barrier to our departure, but we're banking on the motivation to leave will be sufficient. He will have to wear the mask if in a crowd, near construction and in the car unless we're recirculating the air. While he won't have to wear it at home, to reduce the risk of infection, we cannot have live or dried plants in the house and must wash hands diligently when handling food, using the toilet, and coming in from outdoors. We must discourage visitors. If he gets a fever, we'll have to head immediately to the emergency room. We've lamented the change this will require in our lives, but are prepared to accept our new reality to ensure Henry's health. Making this all just a bit easier has been the support we've received friends and relatives from coast to coast. Today Maury stopped by with a list of the offers for help. I was astounded. I cannot find adequate language to express the depths of our gratitude and thankfulness. You humble us with your generosity. I've never been real good at accepting help but the intensity and scale of this has forced me to see and accept our interdependence. So I say thank you. Directly or indirectly, each gesture aids us in providing the best care we can to our family and to Henry. We will try to be gracious recipients and sincerely hope someday to be in the position to pass on your gift. Its amazing what a few hours of sleep can do. When Henry went to bed last night I didn't feel like I could put two sentences together. He woke up telling me he heard a helicopter - the Hopkins Life Flight lands on the building we're in - and pointed out that "you didn't" in that little sing-song teasing voice that kids master somehow with no example. I changed his diaper, being careful to save the strip they have us put in it to collect a sample. Only moments later he was tossing his blankies, beeble (binky), and toys aside saying "I think I have to throw up!". He's 100% on that prediction. I grabbed the bucket and held him up. Its over quickly and the nurse was quick to re-administer his Benadryl which was only a few minutes from expiring. So now its his new favorite, 'Dora the Explorer' at 2am instead of cookies. I lay back down after this episode but recurrent thoughts pounded my brain. Perhaps exhaustion has its benefits. One of the things I still can't quite wrap my head around is the rarity of his condition. The Central Nervous System (CNS) malignancies represented 16.6% of all malignancies during childhood (including adolescence). CNS cancer as a group was the second most frequent malignancy of childhood and the most common of the solid tumors. In the US approximately 2,200 children younger than 20 years of age are diagnosed annually with invasive CNS tumors. Medulloblastoma, Henry's type of CNS cancer, accounts for about 20% of that 2200. For those his age, the incidence is only about 10 in every million. Then account for those considered high-risk. At this point, the 'why him?' impulse occurs to me, but in the same instant I know there's nothing to be done. I really prefer to believe that he's always had it, that its part of him, and to wish it away or deny it, would be to deny him. I'm just not about to do that. Its kind of like his mood or his hair color. It just is. We all have expectations about what will happen for ourselves, our kids - but there are no guarantees. None of us know how long we'll have here to experience life's wonder and each other's love. They say its laughter, but right now Tara and I are feeling like some of the best medicine, at least for us, is seeing Henry with color in his face and having had some extra sleep after a tumultuous night. Henry slept solid for about 3 hours, until about 10 this morning after a bit of vomiting. Tara said he immediately felt better and seeing him wake quietly and in a good mood was just so relieving to see. Tara called this morning with news of an 'OK' night. The chemotherapy I mentioned before has now been administered. She said Henry was pretty restless in the early part of the night. He was fighting taking his oral pain medication which he usually takes more easily. He vomited once overnight after taking some of the pain medicine and afterwards, despite not really getting any in his system, said he felt better. Tara attributed this to relief of some nausea. He was up very early, 5am today. He's had surprising stamina through all this. These drugs are supposed to make him really tired though so maybe he'll get a nap in today. We're hoping for an uneventful day. Where yesterday ended and today began is a bit of blur. Because of the time change and my going solo yesterday night - not to mention, I was beat - I went to bed as soon as Henry did last night. He was up frequently, moaning. My impression is that its mostly him dreaming about his days in the hospital as, for the most part, he drifts immediately back to sleep. He has to pee frequently as they're trying to clear his medicines through the use of intravenous fluids and he occasionally wakes up soaked. This is extremely unpleasant for him and he lets us know in no uncertain terms. Once he's changed though, he's on to some solid sleep for a bit. Around 3am the wakings became more frequent and Henry more alert, complaining of his head and jaw hurting. First Tylenol, then an hour or so later, Oxycodone - much more effective. He was up early, at around 5:30am, and the morning until Tara arrived was pretty consistent; varying complaints of slight discomfort, e.g. "I want to go home", "I'm hungry. ", "I'm not feeling very good", "I want my mommy", etc. We've learned that these phrases are like chants and are not always representative of his mood, but more of his general malaise and dislike of the hospital. Tara arrived in good spirits and took over with Henry. I headed back to check out of the Ronald McDonald house as we've opted for driving back and forth - we've both found it more regenerative anyway. I've found the drives downright therapeutic. My thoughts today were focused on the way the temperate fall has provided tremendously beautiful and slow-changing foliage, a wonderful blessing with as much driving as we have had to do. Many sunny days have provided picture perfect settings for this annual winding down of the year. So much of our lives are cycles; the seasons, the school year, our daily routines, beginnings and endings, ups and downs. I remembered a song from one of my favorite artists, Dave Matthews, its called 'Sweet Up and Down'. Then I was handed a pleasant little coincidence as that very song was next on the CD I was listening to. some you lose, some you win - for us all. On this Sweet up and Down..."
We've thankfully made it through the first part of this cycle of Henry's chemotherapy with few problems, none serious. Tonight we begin the next round; Etoposide and Cyclophosphamide (chemo drugs) and Mesna (to counter side-effects). The drugs they're about to administer threaten to make him pretty uncomfortable and will begin to inhibit his bone marrow growth resulting in a compromised immune system. He still doesn't like to wear the mask outside the hospital room. After a nice day with the family and friends, I returned early to the hospital to relieve Tara. She had an OK night with him, a bit restless from the sound of it. Henry seemed uncomfortable. Today was Tara's turn for a solid night's sleep and some recuperation. Henry was tolerant today of the normal nurse check-in's, but began to experience a side effect of the Vincristine. Apparently after about 60 - 90 hours, patients begin to experience pain in the jaw. It came on quickly, but we noticed as he ate his breakfast he was holding his head in his hands. A bit of Tylenol and some Dora videos quelled this for a time, but Henry decided the pain was not worth eating through. While he wanted to, he didn't really eat much today. We decorated the walls with many of your cards and a couple of coloring pages and had some quiet time in front of a movie. Early in the afternoon, the pain management folks supplemented the Tylenol with a narcotic, oxycodone, and he felt better, ate a little and talked up a storm to my visiting mother. Tara spent the afternoon with the girls and her mom, watching Anna's soccer game and catching up on errands after a family dinner. Time well spent. I'm hopeful for a restful night for her - waking up at home should be rejuvenating. Tomorrow the first dose of chemotherapy medicines should be cleared of Henry's system and we'll start with the next one. I got to the hospital very early today, about 6am. I wondered briefly why it wasn't as busy this morning and then as I tried to get breakfast in the not-yet-opened cafeteria, it then occurred to me. It's Saturday. When I got up to the room, Henry was mercifully (for Tara) still sleeping. I watched and listened to him until he finally awoke. He has many demands right now, so when he's asleep its worth paying attention to. Last night they began another drug, Leucovorin, that rescues Henry's bone marrow and intestinal cells from the effects of the original drug, methotrexate. This also lowers his methotrexate levels and prepares his body for the other drugs. After breakfast and coffee (thank goodness for coffee! ), I headed back toward home for a day with the girls. Anna had a soccer tournament all day (and tomorrow, as they did well!). Sophie and my mother joined us late in the afternoon for the final game and some playtime with some of Sophie's soccer buddies. On the trip to the soccer fields from the Hopkins, I found my mind wandering over various details of recent days, thinking how grateful we are to have such devoted friends and family, excellent care in the hospital, exceptional emotional support. Also how lucky it is that we live in the time we do and have the benefit of the technology, research and other advances that weren't available not so long ago. And these at the expense of past patients and their families, wading through their own anguished times. Then I realized that in future years, decades perhaps, we will be a part of that family as well. I was surprised not to feel a bit resentful of the future care that will be available to patients like Henry - because of Henry. Instead I felt very connected to the whole chain of people and events; grateful to those that were/are motivated by their personal circumstance to endow their knowledge and efforts for our benefit. I am compelled to do the same. I'm not sure how yet, but I felt at that moment that I'm beginning to realize more fully that we're all intimately connected with one another, and with our circumstances. Henry's pain is our pain. It seems a short leap to the pain of the child in the next room, or the next floor, next hospital, next state.....next country. Then I realized a glaring omission in my efforts to appreciate what everyone is doing for us. None of this would be happening - this appreciation we've begun to feel for the moment to moment, contact with caring family, expressions of love from close and distant friends, anonymous tokens of sympathy and support, and a more compassionate understanding of each other and our pain - without the brave little boy lying in the hospital bed now. Please let me correct my mistake by thanking my son Henry for accepting this challenge for the benefit of us all. So after being admitted yesterday and getting our room assignment, we spent most of the evening sitting watching movies and playing in the playroom. We are, for the most part, comfortable. The room is ample and private. I'm writing from the room now as there is internet access. There are myriad resources for children to be engaged; little bikes for the hallway, crafts, toys, games, crayons, movies, and I think there's supposed to be a clown coming by later. Henry's already terrorized the halls with the trike! It wasn't until late last night that he was started on his chemotherapy. The first one they administer is called methotrexate. Its supposed to be the most helpful. They've also given him, and will continue to give him weekly at our checkups, vincristine. He's receiving an anti-nausea medicine as well. There aren't any visible side effects right now aside from having to pee a lot. They capture everything and measure it every two hours to ensure he's clearing everything well. We're not allowed to use the same toilet as him and must use gloves to help him potty or change diapers. Apparently it can be toxic to us by contact. We basically wait until it clears his system - sometime late Sunday or early Monday. Once his levels normalize a bit, then we'll start the other treatments. Because he's beginning to be immunocompromised, he's got to wear a mask when he goes out of the room, and others wear masks when they come in. It makes it difficult to recognize people and its a little off-putting for Henry when they first come in, but as with everything, he's getting used to it. They let us order pretty much any kid food imaginable from room service for him - unfortunately he's not got much of an appetite. Most recently, he's interested in macaroni and cheese. He sat up and ate like a champ. We figure alot of the foods just don't taste right. The cells on the tongue apparently are affected because they are fast growing as well. While he looks just fine and is only a bit uncomfortable, we know the battle within him is raging strong. Its strange to be sitting and waiting. It would be easier in a way to be actively engaging in the fight, but right now we feel mostly like we've jumped off the cliff and are just waiting for the parachute to open - may as well observe the beauty of the clouds as we drift by. Henry and I 'camped' out last night in his bedroom. We've moved his crib into our room but we moved the mattress back to the floor in his room covered by a sleeping bag. I slept on the floor next to him with my feet sticking out of my daughter's pink flowered sleeping bag. Before we laid down, he insisted on having cookies - 'In case we get hungry'. 'OK' I said - I'm doing a lot more of that kind of acquiescing lately. So we had cookies at 2am and left crumbs in the bed. I've never been so happy to have been awakened in the middle of the night as this last night. He didn't cry tonite when he awoke - he just whispered, 'Daddy?' and we were off to the potty. It allowed for a mercifully quiet night for my sleep deprived wife and mother. We were up early watching TV. He asked for some Halloween candy and I said - yep - OK. He forgot about it though before we could get to it. The girls are off to school and we're about out the door. Before we left I wanted to post some pictures of the last few days. We have so many, but I'm running out of time. One thing I want to make sure I take time for, as you all have so generously, is to thank you. If you're reading this now, I thank you and love you all. I have to say - I'm scared, really scared for what he will have to endure. I know he's a brave little boy. He'll probably handle it better than we will. I can't thank you all enough for the love and support you have provided us. We feel embraced by the outpouring we've received. We have activities galore for the hospital. Our girls are giddy with their new bears, toys and games. You are taking care of us and we appreciate it deeply.